"When I told my friends I was renting a chicken coop with egg laying chickens, they thought I was crazy... but it was one of the best experiences my family has had in a long time. The experience of caring for the chickens and collecting eggs each day was a fabulous learning opportunity for my four young children. Giving my children an introduction to understanding where the food on our table really comes from was an even bigger advantage. Originally I was very nervous about what getting chickens would require. I asked a million and one questions, and Tyler and Diana patiently answered them all. In hindsight, I now think it is funny that I was so worried about what keeping chickens would require and whether or not I would be able to do it. It was easier than caring for my dogs! We will definitely make this an annual event for our family, and I highly recommend that anyone out there who is interested in it give it a try! I'm so glad we did!!" "We've really enjoyed having "the Ladies" this month and we'll miss them when they go. We plan on having a goodbye dinner for them with all the things they like: pasta, watermelon, cantaloupe, sunflower seeds, corn-on-the-cob, etc. I've also recommended "Rent a Coop" to others - I never realized raising chickens would be so easy." "Having the chickens for this past month has been such a great learning experience! The hens were so personable and entertaining! They followed me around the yard quite a lot so my husband started calling me "the chicken whisperer"! Our dogs did well also. We followed Tyler and Diana's suggestion and took it very slowly- progressing from not letting the dogs out while the chickens were out, to putting them on leads so they could watch, to using leashes and allowing them to get close enough to be pecked, to finally allowing them to move freely at the same time. After the beagle got pecked a few times, she learned to give the chickens space. The german shepherd/lab mix was smart enough and laid back enough to keep away from them. I believe that the dogs will miss the chickens as much as I will!" "I LOVE THE CHICKENS!! My family loves them and I'm not sure we ever would have made the leap to raising chickens, if renting them didn't allow us to ease into it. We've entertained several neighborhood children with a close up look at the chickens and their portable home. They've been a unanimous hit! Thank you for the opportunity you've given us!" "We are totally in love with the ladies. The oldest one, whom we named Denise, follows me around like she's my best friend. Mabel, the largest one, is such a chatterbox. Always has something to say to greet us. And Emily acts like the youngest little sister, Kind of catching up to everyone else, and then running ahead of the others. They are a hoot. They purr like kittens. Our cats LOVED to watch them. They never dared to raise a paw, but they just sat in the middle of the hens and let them do their thing." "We did the chicken coop last year. It was an amazing experience for our kids, the neighborhood, our dog, and us! Nina, Anna, and Elsa were so friendly, the kids could carry them and pet them. Every time we had an egg you could hear the kids scream all over the neighborhood "an egg, an egg!" Tyler and Diana are awesome and we received great customer service. Our questions were answered immediately and they even came by to bring a third chicken, when one took a little longer to get adjusted and lay an egg. Can't say enough good things about this program! The only problem was, our daughter wanted to keep all the eggs and was upset when we wanted to eat them :)"
"My teen was thrilled when I told her we were going to rent chickens from RentACoop, but little did I know that the pleasure would be all mine. From the moment our two hens were brought, literally, to our door, we loved having "the girls" (as we referred to them) as our guests. They gave us lovely fresh eggs every day, cooed and clucked happily in our yard (especially when we brought them cucumbers) and required so little in return....what a great experience. And the RentACoop team was with us every step of the way. Two thumbs up!" "Initially, we never thought we would have chickens, but once we tried it, the entire family enjoyed the wonderful hens and coop we got from RentACoop. We have many predators in our area, including foxes and hawks, but since we began using the coop designed and created by Tyler and Diana, we have had no problems. We feel comfortable at night knowing that the hens are secure, and it is easy moving the coop around the yard with the built-in wheels. My son Ian loves the hens so much that he took a feather to school the first week to show his class, and he races home to see them every day after school. All in all, we would enthusiastically recommend trying out the hens through RentACoop; we are so happy we did!" "The hens are a HUGE hit with the campers. What a great educational experience. We've been eating the eggs, feeding the hens wheat seeds and different types of berries and watching them eat pests when we find them. As a science and environmental educator, I feel that having chickens is a rich experience and I have pretty much just scraped the surface. Thanks to you and your family for making this available!" "The girls are great. We have fallen in love with them. Vanessa is a girl in charge for sure and she follows us around like a dog. She even followed me onto our deck and tried to come inside. We can't believe how she and Sarah sit next to the sandbox and watch our son play. Of course he makes them food and feeds them - I suspect that has something to do with it. We love having them. Thanks again!" "We tell everyone about the rent a coop and how much fun we had! 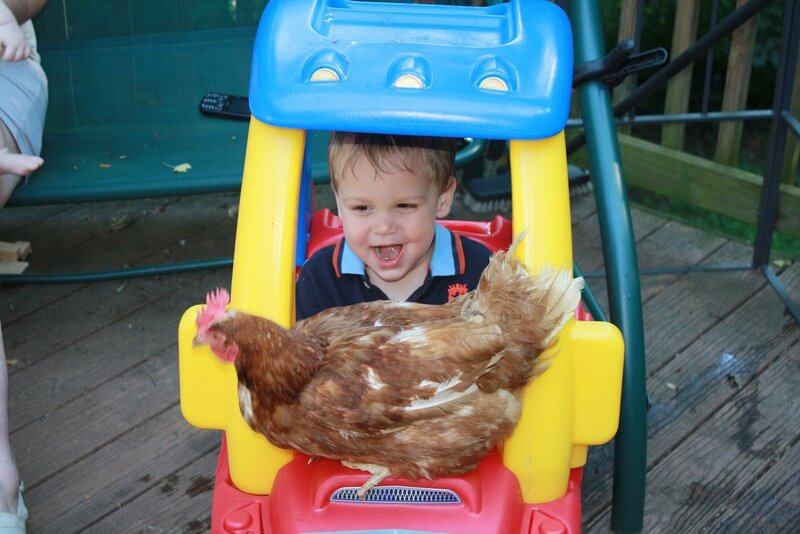 It was the highlight of our winter and the chicken tales are loved by others! Keep up the great work!" "Thanks for everything that you do - the students, teachers, parents, and administration have thoroughly enjoyed having the chicks and learning about their life cycle and the circle of life. I can't imagine a more hands-on way for my students to learn about animals, responsibility, "life on a farm", and being gentle. Your program has enriched our writing, math, and science lessons. I enjoyed watching my students' faces light-up when holding 3-day old chicks and laughing while the chicks played with each other. I look forward to doing your program again in the fall. Thank-you!" "Thanks so much Tyler for the chicks and eggs. I (along with the kids!) am completely enjoying them. One kid yesterday was seeing a chicken for the first time. While holding it, he looked at me with the biggest grin on his face and said "this is the coolest thing ever!! I love nature!". Its already been such an amazing experience for them." "I just wanted to say THANK YOU so much for giving us this amazing opportunity to watch life begin. We candled an egg in the dark this evening (my little one is outside with my oldest) and the chick moved!!!! It was amazing! I am speechless at how beautiful that was. The two chicks are doing great - we are so in love with them. I keep telling my kids that we are just borrowing them but we still love them. Their precious little "peeps" make our day! Thank you so much for this!!! " "Please know that having these beautiful creatures has changed many of us for life. I have learnt that even 'bird brains' show strong bonds of love, and socialization!! I would never have believed that until I saw a newly- hatched chick clambering over the eggs in the incubator to reach the one still hatching!! It was indeed very powerful!! Thank you for raising our level of 'respect' for all creatures, big and small." "I want to thank you again for being so gracious with accommodating us with the chickens for the Science Fair. We had such a fantastic experience, and will undoubtedly like to do it again when our youngest child gets a little older. My oldest son has said that this is one of the funnest thing he has ever done, and had learned so much. As a matter of fact, this was a great experience for the entire family." Thanks again and your program just whisks kids into loving learning!" "It's been a wonderful experience for our whole family"
"My girls are LOVING the chicks. They played with them for hours when we got home, my youngest made a "house" for hers out of a little cardboard box, and my oldest made "chickie blankets" so they would be "comfortable" when they sleep. We've already taken them in for share day at our school where Arabelle proceeded to give a mini-lecture about egg incubation and hatching as well as chick care. "It truly has been very fun for the kids and their friends! To be able to witness the hatching is a very special, precious, delicate moment! :) Certainly brought me back to my childhood!"